Beyond Compare is focused. 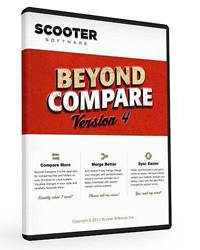 Beyond Compare allows you to quickly and easily compare your files and folders. By using simple, powerful commands you can focus on the differences you’re interested in and ignore those you’re not. You can then merge the changes, synchronize your files, and generate reports for your records. You can compare entire drives and folders at high speed, checking just sizes and modified times. Or, thoroughly verify every file with byte-by-byte comparisons. FTP sites, cloud storage, and zip files are integrated seamlessly, and powerful filters allow you to limit what you see to only what you’re interested in. Beyond Compare’s merge view allows you to combine changes from two versions of a file or folder into a single output. Its intelligent approach allows you to quickly accept most changes while carefully examining conflicts. Color coding and section highlighting allow you to accept, reject, or combine changes, simply and easily. When merging files you can change any line in the output with the built-in syntax-highlighting editor. By using Beyond Compare’s powerful file type support and ability to favor changes from one file, you can trivially accept many changes without even seeing them. Fixed current side indication when switching from path edits to other controls (e.g. “Find what” edit). OS X: Fixed “Touch” dialog modifying dates off by an hour depending on if daylight saving time is in effect. Fixed “Open With” to use URL paths instead of profile: based ones when 1 or more than 2 items are selected. Fixed excess memory usage when loading FTP/SFTP folder listings. Removed “Floating Extended” from “Little Endian Values” and “Big Endian Values” submenus. OS X: Fixed downloading and installing updates failing with a “File missing” error. (Broken in 4.1.4). Linux: Fixed support for -title1 and related switches. Fixed resource leak when generating Folder Compare reports. Fixed exit codes returned when using ClearCase’s -status_only switch. Fixed orphan columns to not be excluded from the comparison. Fixed Session Settings dialog’s handling of last column. Fixed detection of cell type error. Fixed Table Compare crash when regional settings are Dutch but file and format overrides are English.